Animals are becoming an increasingly important part of our everyday lives. Roughly 68% of American households own at least one pet, according to the National Pet Owners Survey of 2017-2018. And in 2017, pet owners spent more than $69.5 billion alone, with healthcare ranking as one of the highest expenses. This trend is expected to continue. That's why demand for veterinarians is expected to increase as well for both companion animals and livestock. Mixed practice veterinarians are practitioners that specialize in health management of both large and small animals. Here's a look at the duties, career options, educational requirements, salary and job outlook for a mixed practice vet. Mixed practice veterinarians are licensed animal health professionals who are trained to diagnose and treat illnesses affecting a variety of species. Most mixed practice veterinarians offer veterinary services for some combination of large animals — cattle, horses and other livestock — and small animals such as dogs, cats and other pets. Mixed practice vets may either operate out of a clinic or travel to visit their patients on farms using a customized truck containing the necessary medical equipment. The usual duties for a mixed practice vet include conducting general wellness exams, giving vaccinations, drawing blood, prescribing medications, performing surgeries, suturing wounds, cleaning teeth, performing spay and neuter operations, and supervising veterinary technicians. Other duties may include monitoring the reproductive health of breeding stock, performing artificial inseminations, assisting with problem births, conducting pre-purchase exams, taking radiographs and performing ultrasounds. Mixed practice veterinarians may work both day and evening hours, and they usually must be on call for emergencies that arise on weekends and holidays. The work can be physically demanding when treating large animals, as vets must be capable of restraining sizeable (and potentially agitated) animals. They also must be careful to avoid bites and scratches while working with small animals. All vets must take adequate safety precautions while treating their patients. According to surveys conducted by the American Veterinary Medical Association (AVMA), the majority of all veterinarians work in private practice. According to a recent AVMA employment survey, there were 117,735 practicing U.S. veterinarians by the end of 2017, with 71,393 of that number engaged in private practice. The vast majority of practitioners work on small animals. Mixed practice vets make up less than 6% of the total number of practicing veterinarians. All veterinarians, regardless of specific area of interest, must graduate with a general Doctor of Veterinary Medicine (DVM) degree. The DVM program is a comprehensive course of study covering all aspects of small animal and large animal healthcare. There are currently 30 colleges of veterinary medicine in the United States that offer a DVM degree. Students may also attend schools with American Veterinary Medical Association accreditation overseas. These schools and their programs have been thoroughly reviewed by an external panel of practitioners and academics. Accredited colleges can be found in Canada, Australia, Europe and the Caribbean. Non-accredited schools may also be an option for students who are looking to study elsewhere. However, after graduation, they must take equivalency exams and complete clinical studies in the United States in order to become licensed. Upon fulfilling any and all educational or training requirements, all vets must pass the North American Veterinary Licensing Exam (NAVLE) to become licensed to practice. Approximately 3,000 veterinarians graduate, complete the licensing exam and enter the veterinary field each year. The median wage for all veterinarians was $90,420 according to data provided by the U.S. Bureau of Labor Statistics (BLS). Earnings varied from less than $53,980 for the lowest ten percent of all veterinary practitioners to more than $159,320 for the top ten percent of all veterinary practitioners. According to the American Veterinary Medical Association, the median professional income for mixed practice veterinarians (before taxes) was $88,000. 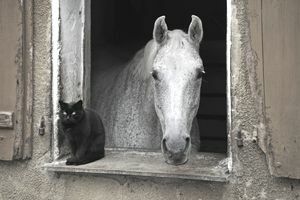 Equine-exclusive veterinarians shared the same median professional income of $88,000. Food animal and companion animal veterinarians earned a slightly higher median professional income of $100,000. In terms of average starting salary right out of veterinary school, mixed practice veterinarians began their careers with a first-year mean salary of $63,526. New equine vets had the lowest first-year salary at $47,806, while food animal exclusive vets had the highest first-year salary at $76,740. AVMA studies also indicate mixed practice veterinarians earn higher salaries in small and medium-sized cities and towns. The best salaries for mixed practice vets are found in cities with populations between 50,000 and 500,000 — mixed practice vets in these areas earned a mean salary of $115,358. Towns with less than 2,500 citizens reported the next highest salary for mixed practice vets, with a mean salary of $100,190. Cities with more than 500,000 citizens reported the lowest mean salaries for mixed practice vets ($90,889). In areas where the population is 500,000 or greater, it is wise to go companion animal exclusive (mean salary $143,736). According to the latest data from the BLS, the veterinary profession is projected to expand at a much faster rate than the average rate for all professions — nearly 19% over the decade from 2016 to 2026. The number of people spending more on their pets — including healthcare — is expected to drive employment in the veterinary services industry. Due to the fact that a majority of vets choose to go into small animal exclusive practice (over 42,000 currently employed in this type of work), there should be a continued need for mixed practice veterinarians in the marketplace, especially in small or mid-sized cities and towns.